There’s no shortage of parkland in Ontario and the Great Lakes region. Even in developed areas like the Niagara Falls area, there’s still an abundance of protected or undeveloped land that retains the character the region has held for centuries. As a key example of the kind of wild terrain and natural features common in southern Ontario, Thompson Point is a great place to visit. Once the site of a long-gone quarry, the point is a small protrusion on the Canadian bank of the Niagara River, accessible from Niagara Parkway not far downstream from Niagara Falls. With free entry and on-site parking, it’s a smaller strip of parkland than larger, more developed areas like Niagara Glen. But the major drawcard is the views of Niagara River and the surrounding land. Niagara Gorge is a sight to see, with greenery all across the sheer cliff facing. On a good day you should be able to see all the way down to the hydroelectric stations further along the river. 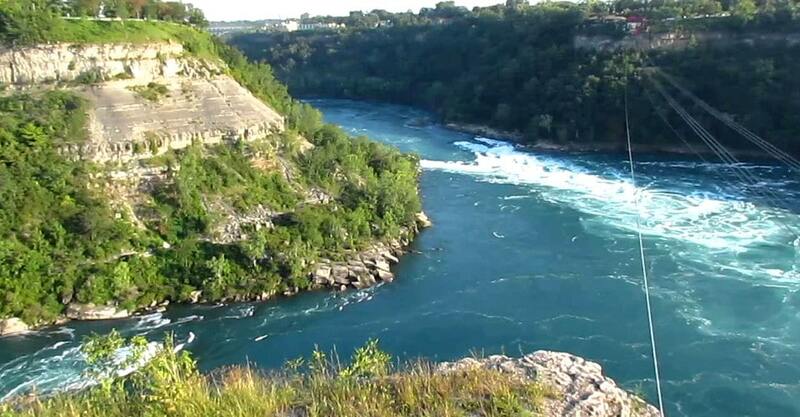 Thompson Point is also one of the main overlooks for the Niagara Whirlpool. Water from the Niagara River flows through with enough speed to create a constant spin cycle in the circular pool, turning the whole basin into a naturally occurring whirlpool with a class six rapids speed in the water rushing outward and downstream. The basin can be viewed from Thompson Point itself from a lookout platform. There’s also the opportunity to use the accompanying Whirlpool Aero Car, itself an International Historic Civil Engineering Work, to get a perfects bird’s eye view of the maelstrom. The aero car travels from one side of the river to the other, making it an attraction in equal use for both the Ontario and New York based visitors. Visiting Thompson Point is also a good stopover on the drive between Niagara-on-the-Lake and Niagara Falls. It’s often a good idea to make a day trip of the passage between these two towns with the parks, wineries and sightseeing available on the way.